we are here to take the burden off of your shoulders and fight for the compensation you deserve. As a Hartford law firm, we at Cicchiello & Cicchiello, LLP are proud to offer high-quality legal services in cases involving personal injury, worker's compensation, and employment law. Our firm is dedicated to serving the best interest of our clients and making sure they receive a settlement that meets their financial needs while giving them peace of mind. As attorneys who have been in practice for many years, we understand the kind of impact an injury can have on an individual and in their life. Likewise, we know that when an employee faces trouble in the workplace, it can create an array of problems. For these reasons, we devote 100% of our time, energy, and resources to building strong cases on behalf of our clients. We are dedicated to providing our clients with competent, compassionate, and aggressive representation for all of their legal needs. Our Hartford personal injury attorneys have recovered millions in settlements for injury victims. For personal injury claims, our dedicated attorneys are committed to pursuing the maximum amount of compensation. In addition to representing victims of personal injury accidents, our attorneys represents victims in the workplace. We also devote a section of our practice to helping individuals file workers' compensation claims. Our clients work closely with our attorneys throughout the legal process. 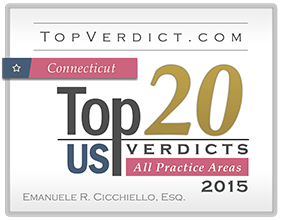 We at Cicchiello & Cicchiello, LLP can handle cases in both state and federal Connecticut courts, as well as in the Connecticut Appellate and Supreme Courts. In addition to representing clients in Hartford, we also provide legal services to residents across the entire state of Connecticut. Why Choose Cicchiello & Cicchiello, LLP?